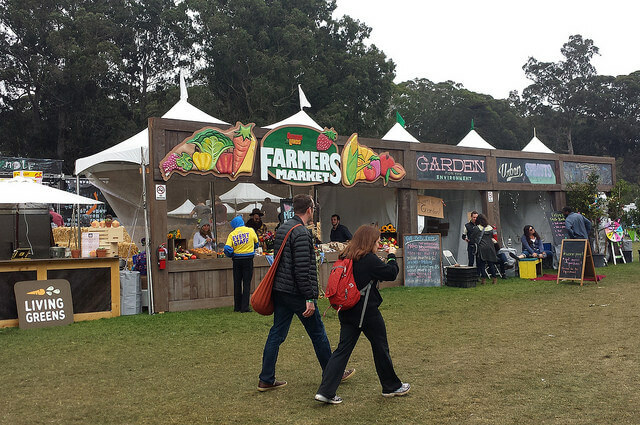 Golden Gate Park was the canvas and the paint was 200,000 sharply dressed, flower crown-clad, Heineken-wielding festivalgoers, 100 diverse musical acts, 70 food vendors, 16 breweries, 36 wineries, countless vendors and dozens of art installations. Against a backdrop of towering trees, tranquility and chaos coalesced as each corner of the park exhibited something delicious, colorful and loud; a dull glimmer of magic weaved between the trees, effortlessly laced through the crowds, and pulsed underfoot. The gates opened at 11 a.m. and through them, among hidden joints and flasks, the crowd brought eager energy and a positive, adventurous spirit. 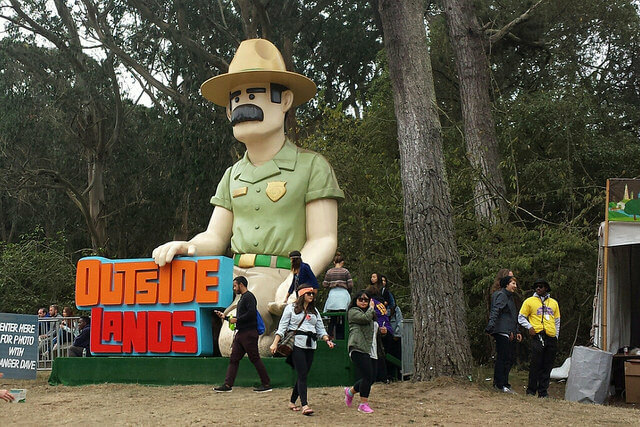 Outside Lands surprisingly matched the San Francisco weather—chill. Pupils weren’t as large, crowds weren’t as pushy and the vibe just felt more engaged with the music than at other festivals. However, the beverage and culinary lineup was almost as impressive as the musical one. Freckled between seven stages named after famous SF landmarks were Wine Lands, Beer Lands, Choco Lands and Cheese Lands—an appetizing spread that would make Willy Wonka jealous. an on-site farmer's market purveyed fresh fruit and flowers. Hip-hop duo Run the Jewels spit blistering rhymes on the Land’s End stage. On the Panhandle stage, Nahko and Medicine for the People gave an uplifting performance replete with ukuleles and crisp harmonies. Grouplove took to the Twin Peaks stage for 45 minutes of raw energy. Next, Bear Hands rocked the Panhandle stage with their dance-worthy experimental indie pop. English electronica duo Disclosure owned the Land’s End Stage in the evening to mixed reviews from the crowd. Their electronic club tunes translated somewhat awkwardly to a daytime festival audience. The musicians commented on the massive congregation of people before them, claiming it was one of the largest crowds they’d ever witnessed. 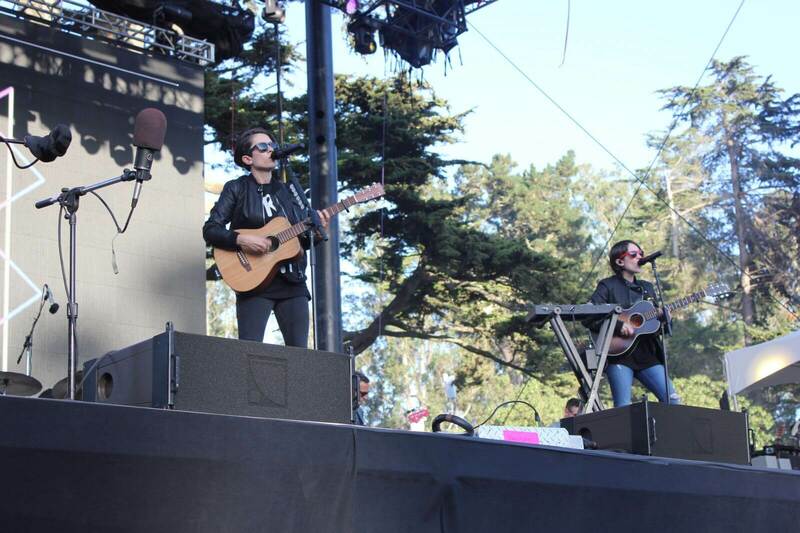 Talented twins Tegan and Sara put on an unforgettable performance at Twin Peaks as the sun sank lower in the sky. A subtle excitement warmed up the chilly evening as the golden glow of the sun disappeared behind the treetops. The windmills, a popular meeting place throughout the weekend, glowed neon green. Sugar skull lanterns loomed overhead as festivalgoers walked through a small forest—home to Choco Lands, The Barbary stage and Camp Grounded—a “digital detox”, which was a refreshing sight at an event that otherwise encouraged incessant documentation. 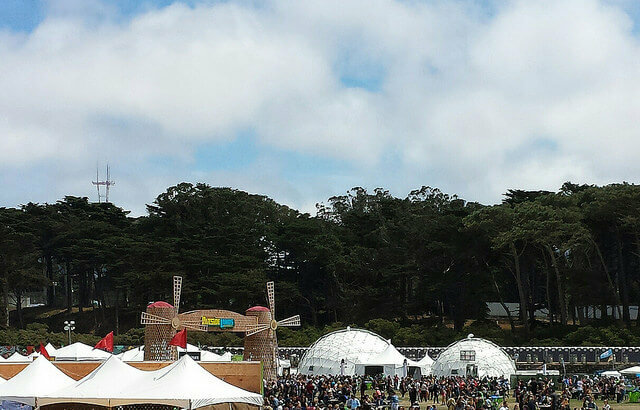 I had high expectations for Local Natives, who played the Land’s End stage at 3, and they didn’t disappoint. Electronic chillwaver Tycho played at 3:40 across the venue. Marijuana smoke blended with the San Francisco fog for an unmistakably relaxed vibe. Alt-rock icons Death Cab for Cutie followed. They played classics from nearly all of their seven studio albums, but their dreary, insular performance merely took us on a walk down memory lane. Haim graced the main stage next. I’ll admit, it was the first time I had listened to the all-girl rock group but I was a die-hard fan by the end of their set. They have an impressive ability to not take themselves too seriously while seriously rocking out. Atmosphere (rapper/producer duo Slug and Ant) , with their earnest lyrics and infectious beats, had the crowd singing, crying, laughing, jumping and screaming. Slug engaged the crowd by altering many of his lyrics to address San Francisco, which sent sinuous shrieks through the crowd. At one point, he ordered everyone to grab the hand of the person next to them. Creating singularity between a crowd of sweaty strangers sent shivers down my spine. The crowd became one for at least half a song. Tom Petty and the Heartbreakers stole the Land’s End stage for a legendary two-hour headlining set. Though Petty is well into his sixth decade, he can still belt “Free Fallin’” like it’s 1989. Meanwhile, Macklemore urged his crowd to scream so loud that everyone across the park could hear them cheer for “Can’t Hold Us”. The third and final day brought Flume and The Flaming Lips, a cancelled CHVRCHES set, a generic Spoon performance and the band that stole the show and our hearts: The Killers. As soon as the first riff of “Mr. Brightside” echoed across the stage, girls climbed onto shoulders and hands reached to the sky. The forest reverberated with the sweet symphony of Brandon Flowers’ voice and the off-key chime of thousands of voices singing in unison. The band was the ideal outfit, put together flawlessly from head to toe. Lasers extended from the stage and into the night sky like glowing tongues trying to taste the stars. Drummer Ronnie Vannucci threw multiple drumsticks into the crowd after the band had completed its hour and a half show, which included an effervescent encore. As Marco Polos, tired eyes and littered water bottles took over the previously energetic park, a thin layer of magic still lingered. It was still threaded among the string of lights in the trees and clinging to the multi-colored lights reflecting off of them. It was dripping off the fog-glazed moon hanging over the emptying field and traversing through the crowd slowly heading toward the exit. It began to fade as girls complained about painful feet and glow sticks began to dim. But the magic still glimmered as beats vaguely pulsed in their heads. The next day, the park bent back into its former shape—a grassy knoll frequented by morning runners and picnicking families—as if the past three days were a dream. It wasn’t just a weekend of music. Outside Lands provided a blissful excuse to take the weekend off work, forget about school looming in the future, spend your paycheck on overpriced merch and allow yourself to believe in magic again, if only for three days out of the year.